The Rio 1 and Rio 2 apartments are in a picturesque, walled hamlet. They are simply furnished. The hamlet is 400 metres above sea level. The apartments are part of a medieval castle which once was the summer residence of the Marquess Malaspina. The roof terrace has garden furniture and a BBQ. 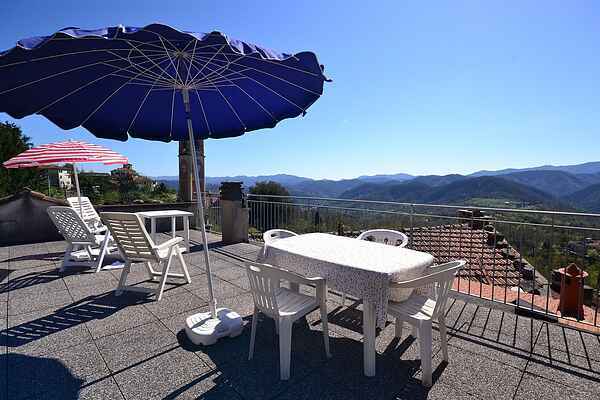 It enjoys delightful views of the Cinque Terre valleys. The terrace is reached by metal stairs. The view from the apartments is of the hamlets narrow streets. The village of Rio is in the Valle del Vara Nature Reserve. This has dense forests and beautiful old towns which are all part of the Cinque Terre region. The sea is only 20 km away. As well as enjoying culture you can also enjoy a day on the beach. - In the village itself are plenty of nice restaurants with local traditional dishes, perfectly safe environment for children - Ideal for mountain biking and walking to visit surrounding villages - At only few miles in Sesta Godano you can see a famous Roman Bridge - On Saturday the weekly farmers market in Sesta Godano - In Airola you have a famous work of the Flemish Jan van Hemessen - Take a boat to admire the Cinque Terre from the water, and for sports enthusiasts there is the "passeggiata dell'Amore" from Riomaggiore. The walk of love, which goes from one village of the 5 Terre to another. - 2 km away is a river for bathing, canoeing, horseback riding, rock climbing, skiing (winter) at and for fishing, hiking, biking. There are waterfalls, white water rafting (rafting), Delta Plano and skydiving. - In a few minutes you're on the famous seaside 5 Terre e on the Gulf of the Poets where famous writers like DH Lawrence and Lord Byron spent their summers. - Lerici and Porto Venere are the two picturesque towns par excellence, an absolute MUST - An hour from Pisa, Lucca, Florence and Genoa are also not much further, to do good for a day trip!